The National Park Service (NPS) operates a network of trails throughout the Delaware Water Gap in Eastern Pennsylvania with the trail system encountering several streams. 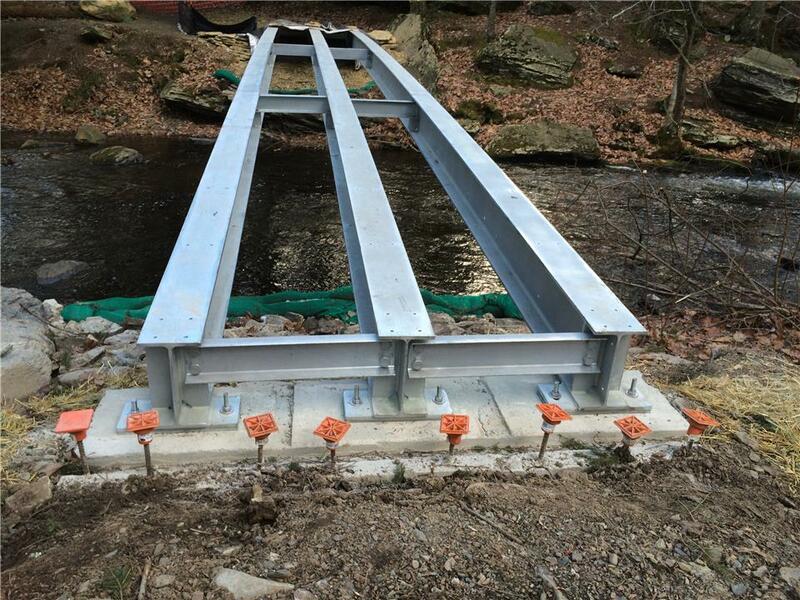 When one of the stream crossings required replacement, Ocean Construction, the project contractor, contacted Contech Engineered Solutions to provide design-build services for the new bridge. The existing structure was a wood beam structure with a wood deck. The bridge had unique architectural features including natural wood railings and fascia panels on the beams. For historical and aesthetic reasons, the NPS wanted the new structure to replicate the existing structure. The new design, however, would utilize galvanized beams in order to more than double the substructure service life. Ocean Construction required that the beams be fitted out with factory installed mounting tabs and pre-drilled holes to accommodate the wood fascia panels, natural wood railings and wood deck. The goal was to install all the wood features while completely concealing the steel beams. The 45' x 6' Continental® steel beam span design was approved, fabricated and shipped preassembled to the jobsite. The contractor installed the beams and completed the field installation of the deck, railings and fascia panels. The required results were achieved and the steel beams were completely concealed with wood. Joe Rodriguez, President of Ocean Construction, offered the following comments on the project: "This was our first project with Contech and the coordination, communication and schedule was second to none. The project was a success, and we are very proud of it."